Great futures are grown from the seeds of opportunity. 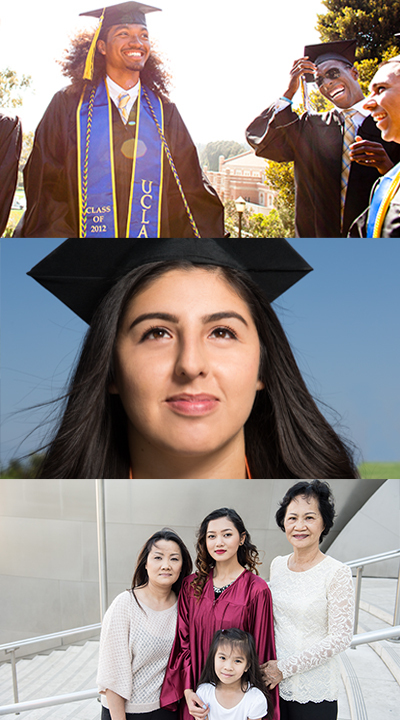 Los Angeles County is a world-class hub for higher education. Yet we are not producing the number of college graduates needed to sustain and grow the livelihood of our region. Only half of all L.A. County students complete high school with the classes required to apply to a four-year college, and just one in five students enrolled in a public university in L.A. County will graduate within four years. We are facing a college graduation crisis. Studies show that a bachelor’s degree creates an additional one million dollars in lifetime earning potential, meaning that our entire local economy benefits when L.A. students graduate from college. But it’s about more than just money. College graduates are healthier, less likely to become involved in the justice system and more engaged in their communities. CCF and the College Futures Foundation, along with investors across Los Angeles and the country, have committed more than $20 million to establish the Los Angeles Scholars Investment Fund (LASIF) in order to address this impending crisis. LASIF combines need-based scholarships with intensive services before and during college to address the financial, academic and personal barriers that have sparked L.A.’s graduation crisis. While the fund is one of the largest scholarship providers in Los Angeles County, we also understand that scholarships alone aren’t enough. Acting as part high-performing mutual fund, part innovation incubator, LASIF works with innovative organizations to combines multi-year scholarships with additional support and resources proven to help students graduate. LASIF’s holistic approach targets low-income Angeleno students with support programs and agencies that increase college readiness, help students and families access all available public financial support and provide counseling, mentorship and other supports designed to get students to and through college. Recognizing that young men of color are underserved and underrepresented in college preparation programs and at most local four-year colleges, in 2017, LASIF launched a targeted two-year, $2 million initiative to support promising practices to better help young men of color access college and succeed once they are in college. In today’s L.A., with high living costs and rising tuition rates, the aspirations of college students can too easily be derailed by acute financial struggles and unexpected crises like not being able to make rent or a surprise medical bill. Traditional scholarships play a vital role in realizing the promise of a college education, but they don’t cover everything. Through LASIF’s Relief from Urgent Student Hardship (RUSH) Fund, nonprofit partners will provide direct grants to students to address a specific crisis or personal need that may otherwise jeopardize their educational dreams. Like all of LASIF’s work, these financial resources are combined with additional services to support student success. To date, LASIF has helped more than 33,000 low-income Angeleno students to prepare for, pay for and succeed in higher education. LASIF scholars have enrolled in colleges and universities across the United States, and 90 percent of students in its inaugural class of 2013 have persisted to their fourth year of college. Learn more about LASIF’s impact and meet our 2018 LASIF partners. For more information, visit our LASIF resource library or contact Kelly King, LASIF director. For information regarding grant opportunities and reporting requirements, please click here. To join with LASIF in building a brighter future for L.A. students, click the button below.